In the pristine Ecuadorian Yasuní National Park, an Amazonian river basin, indigenous peoples are feeling the drain from the park’s oil fields. 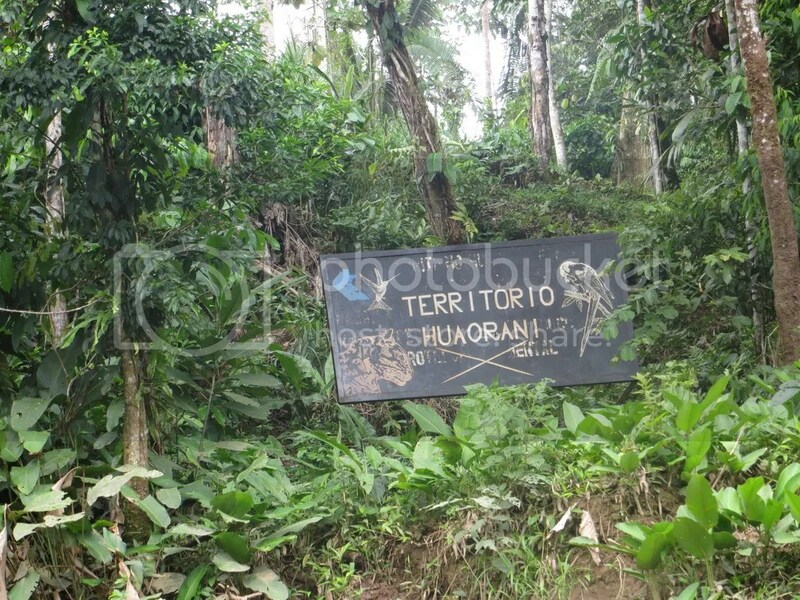 The Huaoranis are one of many indigenous Ecuadorian groups native to the park that are fighting off what they view as encroachment on their ancestral lands. A coalition of international oil companies displaced the Huaoranis for the oil that lies beneath their homes. In 1991, the Organization of the Huaorani Nationality of the Ecuadorian Amazon contracted to allow oil companies to drill Huaorani land. The influence of foreign industries placed stress upon the culture and practices of the indigenous peoples. In August 2013, the Ecuadorian President, Rafael Correa “approved oil drilling in Yasuní National Park, signaling the collapse of an innovative trust fund that would have conserved this biodiversity treasure trove.” Indeed, the park is considered one of the most bio diverse places on the entire planet. The Ecuadorian Amazon basin is home to millions of different species and untouched Amazonian tribes. In 2007 Rafael Correa proposed a plan to prevent rainforest degradation by consciously avoiding “oil exploitation” and choosing to not drill as a country. The Yasuní Ishpingo-Tambococha-Tiputini (ITT) fund was established as a “proposal by the government of Ecuador to refrain indefinitely from exploiting the oil reserves within the Yasuní National Park, in exchange for half of the value of the reserves, or $3.6 billion over 13 years from the international community.” The ITT fund was an attempt at crowdfunding to prevent Ecuador from extracting its natural resources. The initiative sought to conserve biodiversity, avoid environmental degradation and protect the rights of Ecuador’s indigenous groups living within the park. The “precedent-setting” ITT fund implored the international community to assist Ecuador in maintaining the Amazonian jewel of biodiversity that supports the entire world in its production of clean oxygen and its absorption of carbon dioxide. Proponents of the initiative sought to cast the plan as a utilitarian international choice to preserve the world’s natural resources and move forward in the international agenda of weaning ourselves off of fossil fuels. The first step forward, they argued, was to keep the oil from being extracted. President Correa announced that, had the Yasuní trust been successful, the world could have prevented 400 million tons of carbon emissions. The fund received support from many countries and international agencies, but was ultimately unsuccessful in raising the funds that Ecuador had requested. As of 2014, over 45 percent of the Yasuní national park was overlapped by oil concessions and other industrial land grants. When the government was unable to raise the funds it hoped, the Ecuadorian President decided to move forward in oil extraction, much to the outcry of the international community. This decision represents one of many made by poorer, but resource rich, countries that try to balance economic necessity and the growing threat of climate change. Many of these countries, in discourse, are proponents of preventing climate change, but lack resources to do so. Developing countries understand that, without resources and intensive infrastructural investment, they will be unable to accomplish this. The conflict in interests and abilities between nations represents a larger struggle between the developed and the developing nations over who will bear the burden of current and future environmental degradation. In the September 2015 Paris Climate Conference, Ecuador’s environmental minister, Daniel Ortega Pancheco, was chosen to help in the creation of a global climate pact that included talks of politically contentious issues such as “climate compensation, funding to poor countries and the burden emerging economies will have to take in a new agreement.” One main provision of the Paris Agreement that sought to address these concerns was the reaffirmation of the REDD+ initiative, or the “Reducing Emissions from Deforestation and Forest Degradation” program. It would allow industrialized nations to invest in tropical forest protection efforts in foreign developing nations as part of their own domestic environmental degradation mitigation. While the reaffirmation of this was heralded by some groups, others view the program as a way for industrialized countries to avoid reducing their own emissions and impact the land rights and practices of indigenous people. This line of discourse follows a well-established gap between developed and developing nations in opinions over the future of climate action. For many developing nations, the idea that historical context is not relevant in the establishment of a future climate regime obscures the role that industrialized countries have played in the creation of climate change in the first place. The Paris Talks acknowledged this context and sought to create a regime that acknowledges a country’s past contribution to worldwide emission, its development based needs, and the availability of fossil fuel alternatives as a result of these needs. The Ecuadorian Yasuní narrative weaves into a greater one of developing nations being caught in a difficult position of mediation between their economic and development-based needs and their desire to prevent environmental degradation and promote sustainability in light of climate change. The Yasuní ITT fund that President Correa had hoped to establish in the late 2000s and the REDD+ fund can be seen within the context of attempts to innovate and embrace a utilitarian management of the earth’s natural resources that transcends borders. As climate change has grown to occupy national agendas, transnational coalitions formed and tried to rebrand local degradation as part of the greater threat of climate change. Still, the human rights elements of these decisions cannot be underplayed. Indigenous leaders from around the world explained that over 20 percent of the world’s rainforest fossil fuel holdings are underneath indigenous lands. Indigenous rights groups are skeptical of the REDD+ provision of the Paris Agreement, also. These groups are wary towards a program that they believe could undercut their traditional land claims for either corporate or governmental interests. For these opponents, the REDD+ program’s tenuous protections against the further marginalization of indigenous groups in national project planning or against the negation of traditional land rights is a cause for alarm. Much like their national governments, indigenous peoples that occupy lands with fossil fuel holdings occupy a difficult position. They bear the burden of environmental degradation on a greater and more personal level should they choose to embrace extraction, but they also can potentially be harmed by the loose safeguards against land grabbing should they, as a people, decide to be a part to the REDD+ program. They face encroachment on ancestral lands from both international corporations and governments that historically have neither upheld their civil rights nor land holdings. The conclusion of the Paris Climate Summit represents an acceptance by international actors over who will shoulder the burden of implementation in the world’s quest to reduce anthropogenic climate change. Still, this acceptance of burdens was just of the burdens of state actors and not of their citizens, including indigenous peoples. As developing nations retool and restructure their energy policies following the Paris Climate Summit, indigenous peoples, such as the Huaoranis of Ecuador’s Yasuní National Park will bear the true burden of their nation’s decisions to drill or not. For these often uncontacted and historically marginalized out-groups, environmental justice and indigenous rights remain abstracts and do not reflect the reality of their situations. Much work must be done in Ecuador and the world at large to address the toll that environmental degradation and climate change will take on the indigenous peoples. Environmental justice must come to include justice for indigenous peoples and other marginalized groups in their land claims as countries progress towards a fossil fuel-free future.